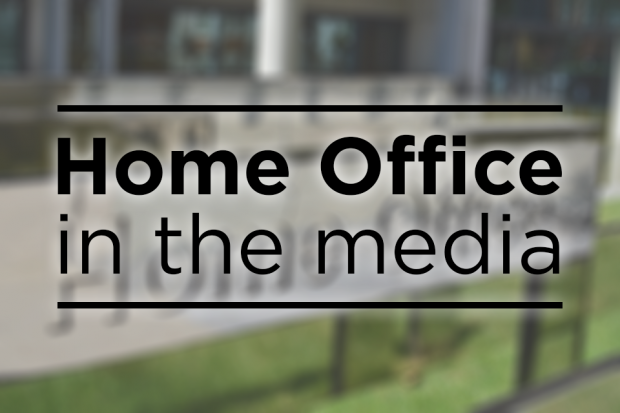 Today’s Home Office in the media stories include the Joint Committee on Human Rights’ report on the Counter – Terrorism and Border Security Bill and the processing time for asylum claims. The Guardian, Times and Telegraph have written stories on a report by the Joint Committee on Human Rights (JCHR) on the Counter-Terrorism and Border Security Bill. The Guardian says the JCHR has raised concerns that the Bill does not comply with human rights, and that academics, journalists or even those with “inquisitive minds” are at risk of prosecution under the proposed laws. The paper states that Home Secretary Sajid Javid has previously defended the proposed anti-terror laws in an article for the Guardian. The Telegraph leads by saying that according to the JCHR, Daesh supporters should not necessarily be criminalised, because it undermines free speech. The paper says that one of the most controversial clauses of the Bill states that viewing material online that could be of use to terrorists will be criminalised if viewed three or more times, which could impact on legitimate study and the work of journalists. This Government does not agree with the Committee’s conclusions in respect to human rights concerns. Its conclusions are misplaced and wrong. After the spate of terrorist attacks of last year and the deadly nerve agent attack this year our intelligence services and police made the case for an update of existing legislation and some new powers to tackle the real and significant threat this country faces from terrorism and hostile states. We carefully considered the request and agreed to act so as to keep the public safe. The Committee couldn’t be more out of touch with the very real threat to life we all now face. The Guardian reports on concerns raised by charity Refugee Action that asylum seekers who are deemed to be facing imminent destitution are still being forced to wait months for government support. The charity analysed 162 applications and found that it has taken an average of 46 days for a decision to be made on their asylum support. Five people waited more than 100 days before being granted support, according to the charity. Refugee Action also claim that asylum seekers who have had their claim refused have to wait an average of 36 days for a decision on their applications for support during their wait to leave the country. Asylum seekers who would otherwise be destitute are provided with free, fully furnished accommodation. We also cover utility costs and provide a cash allowance to cover other essential living needs. The Home Office has a range of targets for processing support applications depending on the nature of the application being made. Anyone with an immediate need for accommodation can ask to be placed in initial accommodation whilst their support application is being processed.